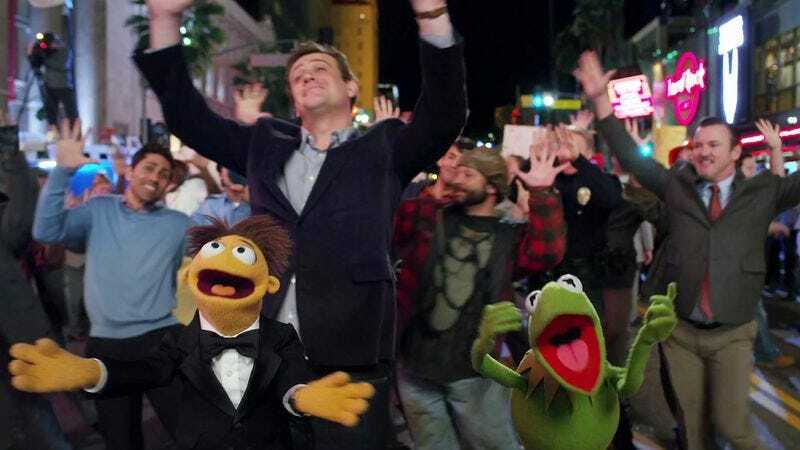 Thus far the marketing campaign for The Muppets has successfully touched even the cantankerous coots who live alone in the spooky, moldering houses of the Internet and forever keep a crook-eye on their lawns, transforming them all into giddy, innocent children who are ready to believe that not all nostalgic reboots are necessarily cynical and exploitative. Ready to have that restorative faith doused somewhat? Then it’s time to play the music, it’s time to light the lights, it’s time to meet The Muppets dissenters—specifically Muppet veterans like Frank Oz who believe that Jason Segel’s take on the beloved characters sacrifices their integrity for the sake of making cheap jokes, and rewrites their personas and relationships in a way that “creates a false history that the characters were forced to act out for the sake of this movie.” Oh, is that all? That grumbling is spread out over this long Hollywood Reporter profile, which talks to various Muppets personnel (most of them choosing to remain anonymous) about how, while they believe his intentions were good, Segel’s vision was ultimately dismissive of what Jim Henson would have wanted were he still around. Among their complaints: A plot point that finds the traditionally loving Muppets disbanded in bitterness over money and Kermit’s disproportionate wealth—which sees Kermit living in a mansion, something they also argue Kermit would never do—plus a willingness to go for “cheap” jokes like Fozzie’s “fart-shoes,” which are prominently featured in the trailer. That kind of cynically 21st-century, fart-laden post-modernism definitely didn’t fly with Oz, who refused to return as the voice of Fozzie and Miss Piggy for the film, explaining in a recent interview with Metro, “I wasn’t happy with the script. I don’t think they respected the characters.” However, he adds, “But I don’t want to go on about it like a sourpuss and hurt the movie,” diplomatically stopping just short of telling your inner child that this Fozzie is a fraud who doesn’t really love them anymore. Wocka wocka wocka!